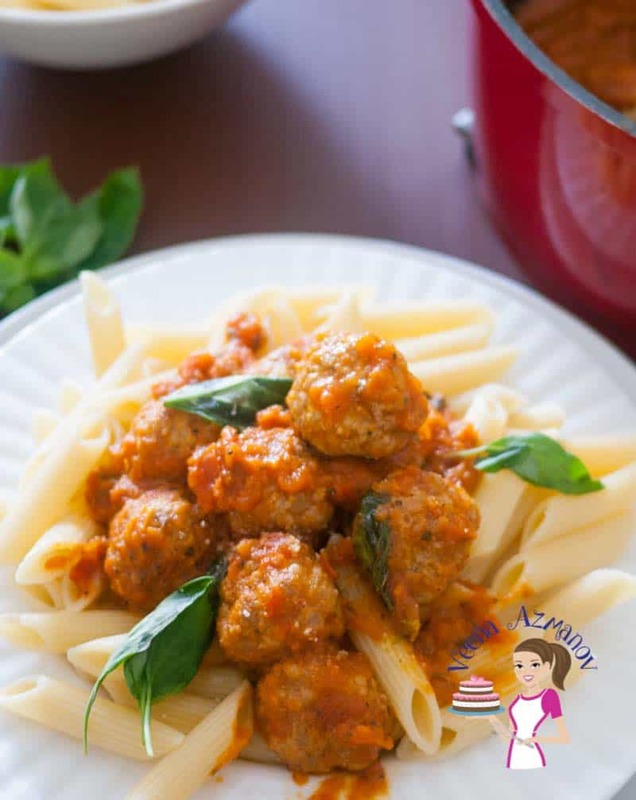 What could be more comforting than Turkey meatball pasta that is nutritious and packed with flavor cooked in a tomato sauce made with fresh wholesome seasonal tomatoes? Place the ground meat in a bowl. Add the semolina. garlic, Parmesan salt, and pepper. Mix to combine. Do not over mix. Form small balls and set aside. Set aside. Place a pot of boiling water and cook the pasta as per directions while you prepare the sauce. Add olive oil in a skillet. Add the garlic, dried herbs, and the onions. Once the onions are translucent add the brown sugar. Leave the brown sugar for about a minute to let it caramelize - The caramelized brown sugar enhances the color of the fresh tomatoes later. Add in the chopped tomatoes, tomato paste, and basil. Add a few tablespoons of water and cook on medium for about 10 minutes. Blend the sauce with a hand blender - I prefer a smooth sauce. Bring the sauce to a boil and low the flame to medium-low. 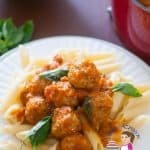 Place the meatballs in the sauce very gently. Do not stir. Shake the pan a bit to help them sink in. Partially cover the pot and let cook on medium low for about 10 minutes. After 10 minutes. The meatballs should have cooked and become firm. Taste the sauce for any seasoning if necessary. Serve with fresh hot pasta.